OS Updates: disable automatic download of operating system updates. In Windows 10, turn on the "Metered connection" mode. File Synchronization: pause any syncing by Google Drive Sync, OneDrive, DropBox, iTunes or other file and media software. Subscriptions: turn off auto-downloading subscription services like podcasts in iTunes. TCP & Bandwidth Monitoring: to see if any unexpected services are using the internet and turn them off. Use lsof -i on linux, TcpView or Netlimiter Free (thanks Sam) on Windows. Browser Updates: disable browser update and add-on updates. Disable Images: in Firefox uncheck Load images automatically checkbox, in Chrome "Content settings" select "Do not show any images" and "Do not allow any sites to use plug-ins"
Use Content Blockers: install AdBlock Plus with all options on, and either uBlock Origin or Ghostery, to avoid downloading random content. Mobile User Agent: use chrome --user-agent flag or use Firefox about:config useragent set a mobile browser UA. This may get you smaller mobile versions for some websites. Pre-fetching: In Chrome disable search-completion and DNS prefetching, in Firefox disable DNS Prefetching. P.S. When tethering an iPhone to Ubuntu desktop, I needed to a special config from http://wan.to/iphone/ and a how-to for iPhone tethering in Ubuntu. 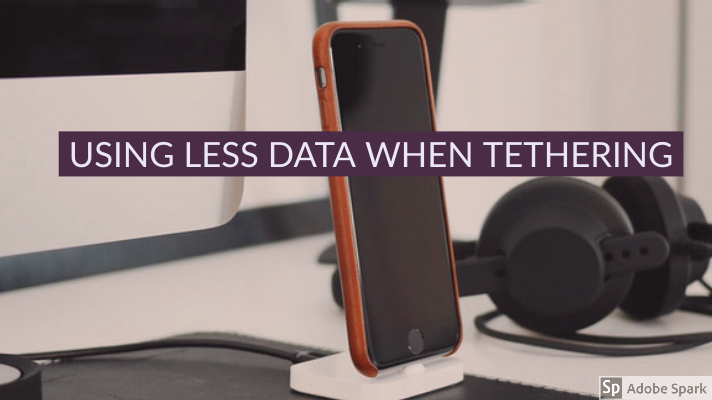 Do you have any more tips on saving mobile data while tethered? Comment below! RE: The iPhone is faster tethered?? Could it be as simple as the PC has more computing power and is thus able to parallelize more simultaneous HTTP requests? Yeah I'm sure the relative slowdown is due to processor speed. I see the same thing on android. One way to check is switch to wifi - in my case it speeds up downloads but not page renders. Also, you can see how *long* it takes to render a page when you load one from the cache. Probably right about the iPhone just being slow, rather than MTN doing traffic shaping. Also, can recommend using opera mini on the desktop (images get resized on their server in Norway, so you only download smaller files). See: http://my.opera.com/larskl/blog/2008/03/29/opera-mini-in-1280-1024?cid=4986133 . Or simply use NoScript in FF - flash and youtube are bandwidth hogs!